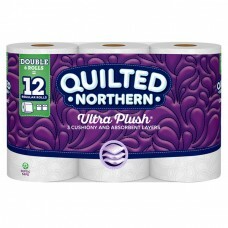 Quilted Northern Ultra Plush® Bathroom Tissue. 3 Cushiony and absorbent layers. 6 Rolls = 12 Regular rolls. Septic safe. Unscented. 102.6 sq ft (9.4 m2). 154 3-ply sheets per roll. 4.0 in x 4.0 in (10.1 cm x 10.1 cm). Persnickety about the good life. Confession: We can be a little obsessive about all the tiny details that go into our products. After all, crafting Quilted Northern Ultra Plush® to upgrade your bathroom experience matters. That's why it features: Three cushiony and absorbent layers for ultimate comfort that still offer a worry-free, septic-safe solution. Our patented technology that delivers the softness you want while cutting down on what you don't (lint!). Responsibly sourced, renewable materials that meet the standards of the Sustainable Forestry Initiative - so it's good for the earth. Flushable and septic safe for standard sewer and septic systems. 2X as many sheets. how2recycle.info. Quilted Northern Ultra Plush, Paisley Droplet Stitching design and the Georgia-Pacific logo are trademarks and/or copyrights owned by or licensed to Georgia-Pacific Consumer Products LP. All rights reserved. Call 1-800-283-5547. Visit www.quiltednorthern.com. ©2018 Georgia-Pacific Consumer Products LP.